I was dying to reorganize my cookbook library. Almost a year passed since the last revamp – about 120 (according to The LibraryThing) more books got acquired, and my interests changed. 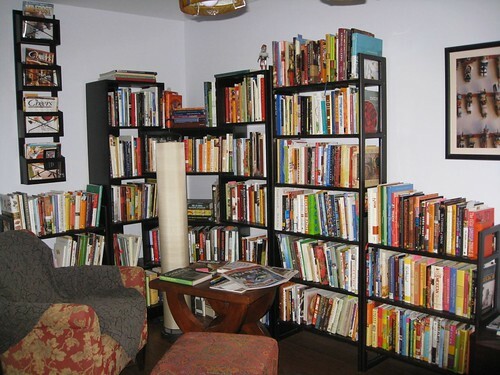 The plan was to keep the same layout – main storage in bedroom and spill over in my office, but to move the books around to suit my needs both for better access and comfortable reading. Now the main section in the bedroom carries chefs, italian, spanish, mexican, japanese, french and vegetarian cookbooks as well as the reference books and assorted food and drink magazines. There is also a small shelf with beer and cocktails books (not shown). All baking, asian, wine and the rest cookbooks i don’t use got relegated to the auxiliary shelves in my office. The new organization makes me happy.